To many guests of our Kennebunk/Kennebunkport Maine Bed and Breakfast, the distinction between the villages of Kennebunk and Kennebunkport is not immediately apparent. That’s because the heart of the two are separated only by a short bridge over the Kennebunk River. Kennebunkport’s Dock Square Area lies on the east bank of the river, while Kennebunk’s Lower Village lies on the west bank. Restaurants and shops companionably sit shoulder to shoulder on both sides of the river, giving the impression that the two villages are really one. Yet Kennebunkport and Kennebunk do have distinct personalities. Their differences are subtle, to be sure, but they can be felt. Jonathan Vatner of the New York Times visited the area and our Kennebunk/Kennebunkport Bed and Breakfast. He writes about the “close-knit community of locals and big-city imports” who have energized Kennebunk’s Lower Village, filling the historic buildings with “funky restaurants, shops, and lodging options”. To him, Kennebunk is “a vibrant destination distinct from its upper-crust neighbor”. We’re some of those big-city imports who are thrilled to make our home and our livelihood in Kennebunk. 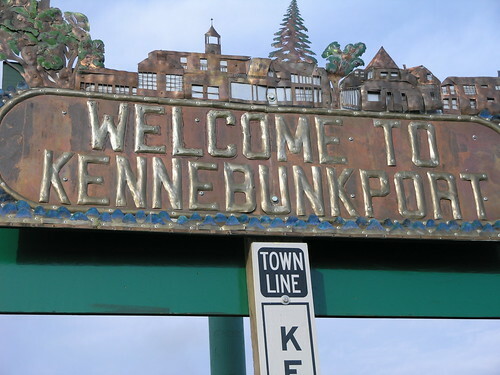 We are also happy to be neighbors with Kennebunkport. As far as we’re concerned, we’ve got the best of all worlds. Please read Jonathan Vatner’s New York Times article “Detour Near Kennebunkport, Me.” We hope you’ll then come visit both Kennebunk and Kennebunkport.